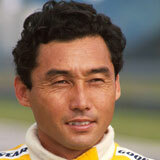 Japan's first regular grand prix driver, Satoru was Honda's representative on the grid in the late 1980s. After a glittering career in Japan, he moved up to Formula One and was made Ayrton Senna's team-mate at Lotus in 1987, when the team first ran Honda engines. Miles off Senna's pace, Satoru ran much closer to Nelson Piquet in the team in 1988, and in '89 matched his best Formula One result, coming fourth in the torrential rains of Adelaide. Satoru raced for Tyrrell for the next two seasons, before bowing out at the end of 1991 to run teams in both Japanese Formula 3000 (Formula Nippon) and Formula Three.